Get World Class Mobile App Development Now! The world is going mobile. This mobile development is one of the fastest growing sectors in the IT industry and expected to be growing more in near future. From Fortune 500 companies to small businesses, every one has attempted to create their own image and identity on the mobile platform. With Supro InfoTech’s experienced and resourceful staff, you can too. There is no perfect application. However, you can get close with proper UI/UX design, and appropriate strategy made by experienced Mobile App Developers. Supro InfoTech designs and develops apps which are user centric. We brainstorm ideas, invest sufficient time in research, we navigate through trends, work on the use case of an app and then start designing part. If required, we also take help of ideation service before executing the idea and starting development phase. While working on Mobile app development project, we make sure we deliver just best and nothing less! We offer Mobile Application Development for Android, iOS and Windows. 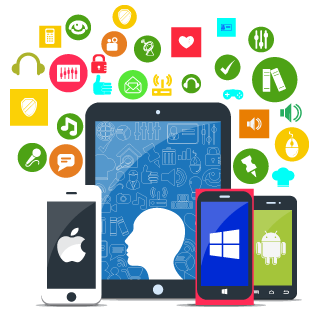 We also offer cross platform mobile application development service for those who may target all mobile operating systems in future. We will maintain uniform image across all platforms. Before the process of development of application is started, it is important to get an idea about how much cost will be incurred in the whole process and in what time will it get completed. Having an idea on such aspects helps us to plan the things accordingly and also arrange for requisite finance for the development. We operate by providing a detailed timeline for with milestones to our clients and ensure that the product is released on time. As a leading mobile application development company, Supro InfoTech has extensive experience in creating high performance, feature-packed native mobile applications for all the major mobile platforms including iOS, Android, BlackBerry OS and Windows Mobile. Additionally, as experts at HTML5 development, Supro InfoTech can also build cross-platform mobile applications that will work on any device or platform. Companies and organizations choosing Supro InfoTech for their custom mobile application development needs can be assured that their final deliverable, no matter the technology its built on, will be secure, scaleable and sustainable in whatever environment its hosted. Looking for One Stop Mobile Application Developer?